Bienenstich (Bee Sting Cake) is a yeasted sheetcake with a buttercream (or whipped cream) filling and a caramelized nut topping. It is very popular all over Germany. Traditionally, German buttercream is made with butter, sugar, and eggs. But these days most recipes call for custard powder instead of eggs. (I really had no idea how popular custard is in Germany! I am not the biggest fan – but now that I am doing this theme I realise that so many German dessert recipes call for custard.) In the area where I grew up, Bienenstich was not made with buttercream at all. We used sweetened whipped cream instead. If you look at that recipe you can see that it calls for 4 eggs. Many vegans would tell you to stay away from such a recipe. They doubt you can replace all those eggs and get a result that is similar to the original version. Sometimes that is true. But if you look at that recipe again, you will also see that it calls for 150 g of butter. That butter will add flavour and it will moisten the cake. But it will also destroy its structure as it coats the flour proteins and keeps them from forming gluten. To make the cake lighter and improve the structure, you need more eggs. When I adapted that recipe I simply cut out some of the fat and added some milk to provide the liquid the eggs usually would provide. Problem solved. This method works for most cake recipes that call for a high amount of fat and eggs. The topping is usually made in advance, sprinkled on top of the batter and baked with the crust. For my cupcakes I tried to caramelise the nuts and the sugar in a pan and that didn’t go so well. 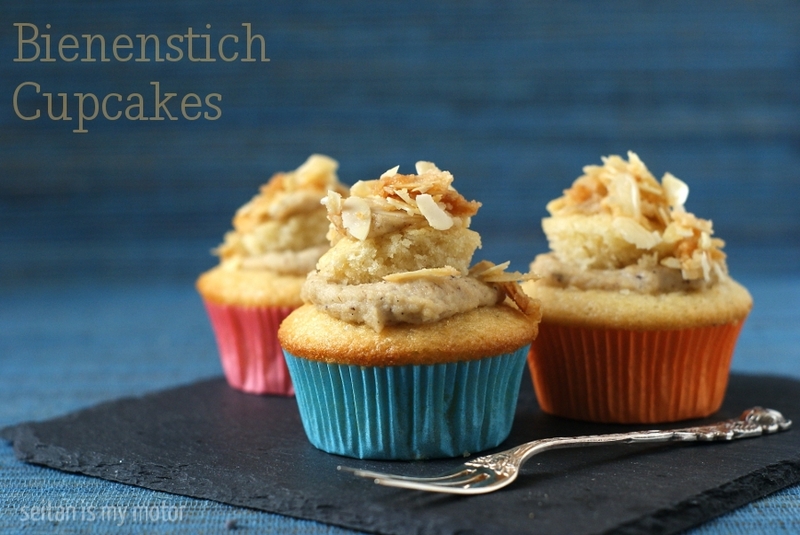 I looked up other Bienenstich cupcake recipes and found a great alternative to my method here and here. I’ll post this method insteead of my original version. When it comes to the filling I have to admit that I don’t like buttercream. It is too heavy for me. I thought about using vegan whipped cream, but the versions I tried so far often have an artificial taste or they are not widely available. So I simply used my almond cream recipe. Here’s a buttercream recipe, if you want to go for a more traditional Bienenstich filling. Preheat the oven to 180°C (350°F). Line 9 muffin tins with paper liners. Set aside. In a bowl combine flour, sugar, baking powder, and salt. Mix well. Add remaining ingredients. Beat everything with a hand held blender. Pour into muffin tins and bake for 20 Minutes, or until golden brown. Remove and let cool. Combine almonds and remaining ingredients for the cream in a blender. Blend until smooth. Set aside. Cut a hole in the middle of each cupcake. Reserve the tops. Fill the cupcakes with almond cream and carefully put the tops back. Use a spoon to distribute the topping on top of the cupcakes. (It will look different from the pictures above since I used my first topping version that didn’t come out so well. You should have some almonds on top with caramelized sugar running down the cupcake.) Serve and Enjoy! Are there two “almond creams” in this recipe? One for the filling adapted from one of your other recipes. Three tablespoons of the other is called for in the frosting. It seems to be like a thicker almond milk. I haven’t found the second cream in my store. Do you think this recipe would produce a good substitute? https://www.vegansociety.com/resources/recipes/starters-snacks-and-sides/almond-or-cashew-cream Or what would you suggest? Thank you so much for this tempting recipe. I’m getting ready to try it for a friend’s birthday who said if I every wanted to make her very very happy I should make a vegan bee sting cake. Thank you so much for your quick reply. I wound up just substituting with coconut cream for the second one with very good results. Delicious and so pretty too. I made the cupcakes so my husband could have one today. Will finish the rest tomorrow. Next year I’ll make your “proper” version! You must have read my mind! I’ve wanted to make a bee sting cake for years, and I was gearing up to make one for Rosh Hashanah when I ran out of time. It might be another year still before I make my interpretation, but I’m thrilled to have your formula to refer back to now. The cupcake format is such a smart twist, perfect for a smaller gathering, too. Your MoFo posts and blog are amazing! I loved Bienenstich pregan, and I love that you share this recipe with us. Everything about this is a win! I found your blog through Vegan on the Prowl. Thank you so much for the fat vs eggs tip. It’s really good to know that recipes which are heavy on eggs can be veganised in a simple way. Yes! Bienenstich is my absolute favourite, so I can’t wait to try these. I told my (German, omni) mum about your theme over the weekend and she’s just as excited as I am to try vegan versions of all our family favourites. Beesting cake is one of my all time favourites. I remember eating it from local bakeries as a kid all the time. My friend Leigh has a recipe in one of her cookbooks for a version that is very similar to the one I had as a kid. Though I am not sure how close Australian bakery Beestings are to the German original. This recipe sounds delicious. I’m posting cupcakes for Vegan MoFo and I’m going to try out your version. Outstanding pictures as usual! That is awesome, thank you! I hope you’ll like them. These look absolutely delicious. Also really looking forward to seeing your buttercream recipe! Ohhhhh this looks amazing, I can’t wait to try it. Brilliant job veganizing it! I’ll let you know how it turns out once I’ve made it! Thanks, that would be cool! Oh my goodness! They look beautiful! Wow! This is so impressive! I want to make everything you’re making this month! I wonder why it’s called bee sting cake? I’m learning so much about baking in general from you, as well as about German desserts! These cupcakes look beautiful. I’m not big on buttercream either but definitely like the look of your almond cream. I never knew that about the butter/eggs, brilliant! Thank you for the tip! Mihl, they are gorgeous! The golden almonds on top make me want to eat a whole dozen. Oh my goodness. these sound incredible. Your blog is one of my favourites and I’m so looking forward to what the rest of Mofo brings! Thank you, Crystal! I am super glad your blog is back! Ich lieeeebe Bienenstich, aber ein ganzes Backblech ist mir immer zu viel. Das Rezept wird deshalb ausgedruckt und so bald wie möglich nachgebacken. Yum! Almonds are easily my favorite nut, so I am sure this cake would be on the top of my list. I am not a fan of buttercreams either. A coconut whipped cream would probably be pretty nice too. Das Rezept muss ich bald machen! I already love this MoFo theme, I’d never heard of this type of cupcake and I’m pretty impressed with your veganising, I totally run away from 4 egg recipes! Yes! Fearlessly conquering a 4-egg recipe with knowledge and confidence! Way to go! Ich wünschte, ich könnte in den Bildschirm greifen und mir einen nehmen. So hübsch :-).